All three animals are big cats found with different or overlapping ranges. 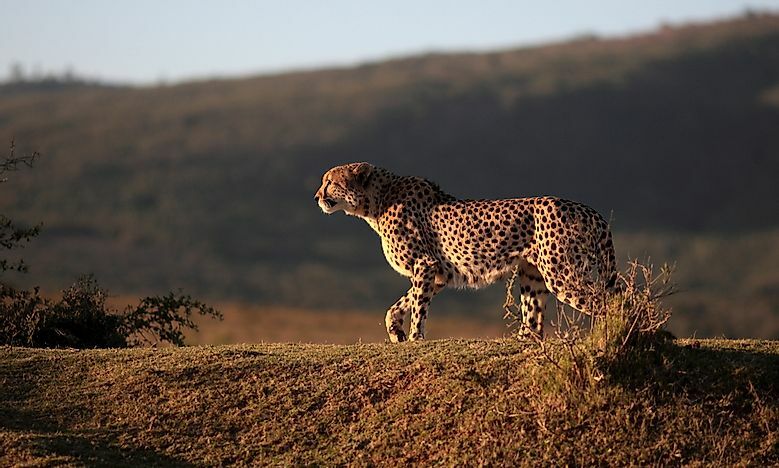 A cheetah on the African plain. The term big cats refer to tigers, lions, cheetahs, jaguars, and leopards. These feline species are all predatory carnivores and can be found throughout the world. Although similar in structure and behavior, each of the big cats is a unique and independent species. For most people, the differences between tigers and lions are easy to spot. Cheetahs, jaguars, and leopards, however, can be more difficult to identify. This article takes a closer look at each of these big cats and the differences between them. The cheetah is the only big cat that does not belong to the Panthera genus. It is classified under the Acinonyx genus and can be found throughout southern and central Africa and in limited areas of Iran. This species grows to between 28 and 35 inches in height and weighs between 46 and 159 pounds on average. In appearance, the cheetah is yellowish tan in color and covered in approximately 2,000 black spots. Perhaps its most unique identifying marking is the black, tear-like stripes that run from the corner of their eyes to the outer edge of their mouths. Cheetahs are active during the day and tend to form life-long groups that protect the territory of the males. Adult females are more likely to live solitary lives than males. Cheetahs are the only big cat that is incapable of roaring. Its conservation status is listed by the IUCN as vulnerable. The jaguar is the only Panthera genus big cat that is native to North and South America. It is the largest feline in the Americas and the third largest in the world (after tigers and lions). This species grows to between 25 and 30 inches in height and weighs between 124 and 211 pounds, making the jaguar slightly shorter and significantly heavier than the cheetah. In appearance, the jaguar has a dark yellow base color, although this can range to reddish-brown and even black. It is covered in spots, which are typically solid across the head, neck, and tail. Across the body, however, these spots may occur in irregular shapes and often appear as a ring-shape surrounding a smaller spot. The jaguar can also be identified by its legs, which are short in comparison to the rest of its body, and its tail, which is the shortest of any big cat. Jaguars are active at night and tend to live solitary lives. Its conservation status is listed by the IUCN as near threatened. The leopard belongs to the Panthera genus and can be found across sub-Saharan Africa and in some areas of Asia. This species grows to between 22 and 28 inches in height and weighs between 62 and 198 pounds, making it smaller than the jaguar. The leopard has similar physical characteristics as the jaguar; however, its spots are located closer together and do not typically appear as a ring surrounded a central spot. Leopards that live in forest habitats may have a slightly darker base color than those living in desert habitats. Leopards are active at night and are solitary and territorial. Its conservation status is listed by the IUCN as vulnerable.